TEL AVIV, ISRAEL, February 13, 2019 /EINPresswire.com/ — Cato Networks, the leading provider of cloud-based SD-WAN, today announced that it has been certified as a connectivity partner by RingCentral, a leading provider of enterprise cloud communications, collaboration and contact center solutions. The certification was provided as a result of call quality and resiliency testing performed by RingCentral that demonstrated the ability to maintain enterprise call quality even with sub-standard network performance using SD-WAN from Cato Networks. For far too long, supporting on-premises voice and video services has chained global enterprises to their Multiprotocol Label Switching (MPLS) networks. With Cato Networks, enterprises can accelerate cloud communications migration using affordable, optimized, and predictable, global cloud connectivity. Through RingCentral’s testing, Cato Networks was able to guarantee high quality voice calls even with more than 15 percent network packet loss. The RingCentral testing required calls to maintain MOS scores of 3.8 or higher, which is considered high quality. ● MINIMIZING LATENCY by carrying cloud communications traffic across Cato’s optimized and managed global network, not the public Internet, directly into the same physical datacenters shared with RingCentral. ● PREVENTING CONGESTION AND LAST-MILE PACKET LOSS that undermines voice quality with sophisticated upstream and downstream Quality of Service (QoS), traffic prioritization, and Policy-based Routing (PBR). ● COMPENSATING FOR BROWNOUTS AND AVOIDING BLACKOUTS in the last mile with Active/Active Protection and Packet Loss Mitigation techniques. ● SECURING USERS and the corporate network against network-based attacks without the need for additional appliances or security services. To learn more about the Cato Networks and RingCentral partnership and experience first-hand Cato Network’s ability to deliver high-quality voice with even 15 percent packet loss, watch this brief webinar and demonstration or visit https://www.catonetworks.com/blog. 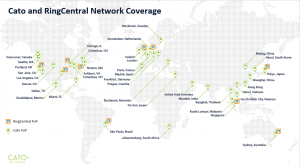 Cato Networks, the cloud-native carrier, connects enterprise locations, users and cloud resources into a global, secure, and optimized cloud-based network with built-in SD-WAN, network security, and WAN optimization. Unlike legacy telcos, Cato is agile, affordable, simple to deploy, and quick to adapt to changing business needs. Using Cato, customers can cut MPLS costs, improve performance between global locations and to cloud applications, eliminate branch appliances, provide secure Internet access everywhere, and seamlessly integrate mobile users and cloud datacenters into the WAN. Visit www.catonetworks.com and Twitter: @CatoNetworks.